My family and I recently got the opportunity to attend the Disney on Ice "Worlds of Fantasy" at the Staples Center. We thoroughly enjoyed every moment of our first ice-skating show ever!!! One tip, DRESS WARM. The show started off with familiar Disney characters Mickey, Minnie, Goofy and Donald. All the kids cheered as they saw their favorites skate on to the ice. The "Cars" portion of of the show was even more impressive with pyro-technics, flashing lights and smoke machines. Ariel and characters from "The Little Mermaid" re-enacted scenes from the movie. All the lifts and jumps mesmerized everyone in the audience, young and old. One of my favorite parts was "The Lion King". I saw the stage production at the Pantages Theater in Hollywood and they successfully re-created the same effects on ice. The stampede was choreographed perfectly! Overall, Disney on Ice "Worlds of Fantasy" is a MUST see! This would be a great holiday treat for the entire family so be sure to catch it before it's final run at one of it's four venues on Dec. 30th. For more info go to www.disneyonice.com. Disney on Ice Presents "Worlds of Fantasy"! Disney on Ice is presenting a spectacular new show called "Worlds of Fantasy". 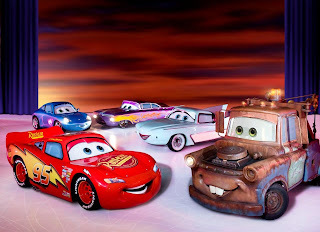 This exciting action-packed ice spectacular showcases all-time favorite characters from Disney/Pixar’s "Cars" and Disney’s Tinker Bell, "The Lion King" and "The Little Mermaid". Families will also get an opportunity to participate in a pre-show meet and greet with a Disney Princess. Audiences will thrill to high-speed stunts as Lightning McQueen, Mater and the crew of Disney/Pixar's CARS race through Radiator Springs. Dive into The Little Mermaid's enchanting undersea kingdom and experience the 'Circle of Life' with The Lion King. Then, enter into the magical world of Pixie Hollow with Tinker Bell and all her fairy friends as they make their world premiere on ice! From wheels to waves, Pride Lands to pixie dust, Favorite Disney moments come to life at Disney On Ice presents Worlds of Fantasy. 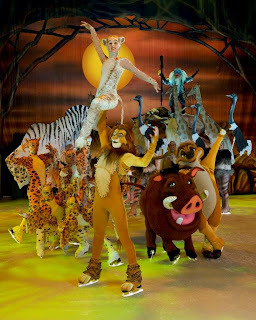 Dazzling skating, special effects, amazing animatronics, and beloved characters are certain to create a lifetime of memories.